Balance-of-payments crises share the same core problem: a country invests more than it saves, consumes more than it produces, and imports more than it exports, all of which is reflected in a current account deficit. When the foreign capital that finances these imbalances dries up, crisis looms. For example, Greece’s current account deficit of 11.2 percent of GDP in 2009 implies that the country was consuming about one tenth more than it was producing at the eve of the crisis. From this perspective, it is not surprising that the adjustment process has proven painful. The purpose of this essay is to situate the Greek experience in a wider perspective by comparing the Greek crisis and its politics to similar crises in other countries. It first discusses why we see variation in policy responses and crisis politics across crisis countries. The second section discusses how the euro crisis differs from other balance-of-payments crises. Finally, the third section discusses the implications that arise from this for Greece. What are the policy options for countries faced with balance-of-payments crises? These countries need to cut consumption and boost production, and there are several strategies how this can be achieved. The first option, and the one most frequently exercised in the past is exchange-rate devaluation, a strategy also known as external adjustment. This strategy makes exports cheaper and imports more expensive, and hence helps the economy to rebalance. A second possible adjustment strategy is internal adjustment, in which relative prices are reduced through austerity and structural reforms (this is the strategy pursued by the crisis countries in the Eurozone). Because cutting back consumption is never popular, both of these adjustment strategies tend to be economically and politically costly. Policymakers therefore frequently resort to a third option: financing the current account deficit. Possible sources for such funds include capital officially provided by international organizations such as the International Monetary Fund (IMF) or other governments, but also less visible transfers such as those recorded in the European Monetary Union’s (EMU) Target2 balances. The problem with this strategy is that financing does not resolve the underlying causes of imbalances, unless it is conditional on substantial reforms. Balance-of-payments problems thus confront policymakers with a list of unattractive options. Which of these are they likely to choose, and how easy is it to implement this choice? Assuming that policymakers care about the state of the national economy, they consider how the different options for policy adjustment will affect the country as a whole and choose the option under which the country’s economy will suffer least. This suggests that policymakers decide on their preferred adjustment strategy by considering the country’s “vulnerability profile” – i.e., the potential costs of external adjustment for the country relative to the potential costs of internal adjustment (for a more detailed discussion see Walter 2013, 2016). The choice of adjustment strategy is clear-cut if one adjustment path clearly imposes more costs than the alternative, because this setting creates strong incentives to implement the less costly strategy in a swift and decisive manner. 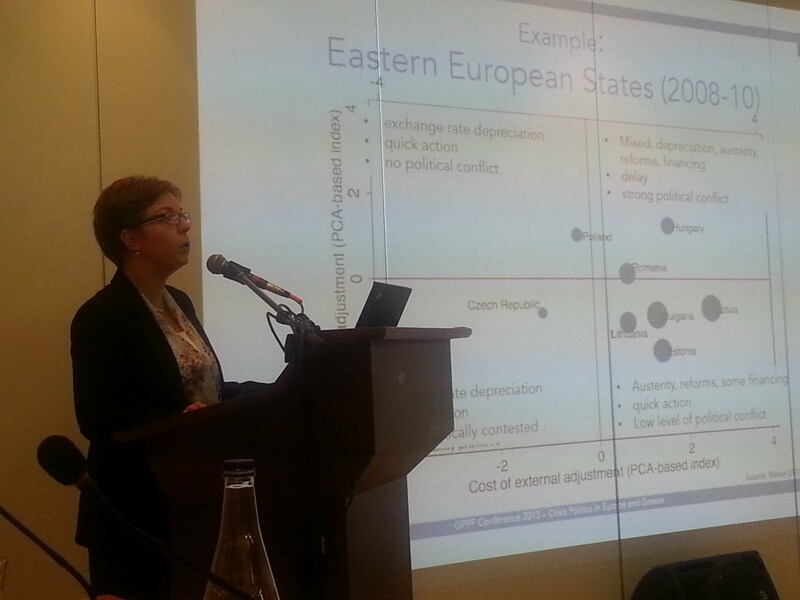 For example, countries for which austerity and structural reforms are very costly, whereas the potential costs of external adjustment are comparatively low (such as a country characterized by high unemployment, inflexible labor markets and a large export-oriented sector) typically respond to balance-of-payments pressures with a swift devaluation of the exchange rate and without much financing. Taiwan in the Asian Financial Crisis or Poland in the 2008-10 Global Financial Crisis are good examples for this type of country. In the latter case, internal adjustment was potentially costly because of high unemployment rates and a strained fiscal situation, while the country was barely vulnerable to a depreciation of the currency. When BOP pressure emerged, Poland therefore immediately allowed its exchange rate to depreciate, a strategy that was uncontroversial and even welcomed by the export industry. Throughout the crisis, the centrist coalition government under Prime Minister Donald Tusk remained popular and did well in all elections. In fact, Poland was one of the few countries in the region where more conservative challengers did not replace the incumbent government during the crisis. Likewise, when the potential costs of devaluation are significantly higher than those of internal adjustment, governments are likely to opt for internal adjustment, while maintaining exchange-rate stability. For a long period of time, this vulnerability profile was thought to be unlikely to materialize; in fact, several studies suggested that democracies would ultimately always devalue rather than implement painful domestic reforms (Eichengreen 1992; Simmons 1994). However, in some countries, financial globalization has vastly increased the vulnerability to external adjustment (Walter 2013). For example, when labor markets are flexible, but the private sector is highly indebted with foreign-currency denominated debt, internal adjustment can become the preferred adjustment strategy. Because domestic prices decrease more slowly with this strategy, some temporary financing to bridge the time until the reforms start to bite is likely, but such financing will be regarded as a way to smoothen, rather than avoid, adjustment. The experience of four Eastern European countries - Bulgaria, Estonia, Latvia, and Lithuania during the global financial crisis is instructive. When hit by the crisis, these countries quickly implemented harsh internal adjustment strategies involving large fiscal adjustment, huge cuts in public sector employment and wages, as well as health, education, and labor reforms, all in an effort to maintain their exchange rate pegs with the euro. High levels of foreign currency borrowing and the strong wish (both for economic and geopolitical reasons) to join the Eurozone in the near future made these countries very vulnerable to external adjustment, whereas rather flexible labor markets and a sound fiscal situation reduced the potential costs of internal adjustment. Thus, although the internal adjustment strategy plunged these countries into deep recessions and tripled unemployment rates, the policy decision to maintain exchange rate stability enjoyed strong popular and political support. All crisis countries in the Eurozone have embarked on this adjustment path as well, largely because an exit from the Eurozone would be associated with huge costs. Policymakers face a much more difficult situation when both internal and external adjustment are very costly – for example because a country exhibits high levels of unemployment, rigid economic structures, and widespread foreign-currency denominated debt. For countries with this vulnerability profile, distributive conflict is a defining feature of the resolution of balance-of-payments crises. This vulnerability profile therefore creates strong incentives to instead avoid (or at least delay) adjustment and finance the current account deficit instead. Crisis politics in countries with this vulnerability profile will be fraught with political conflict, delay and attempts to involve other countries in the crisis resolution process through financing. Examples for countries facing crisis with this vulnerability profile abound and include Mexico in 1994, Thailand and South Korea in 1997, and Hungary in 2010. In Hungary, for example, high levels of foreign-currency denominated borrowing coupled with a strained fiscal position rendered both adjustment policies costly. As a result, Hungarian crisis management was characterized by delay, IMF involvement, and a deteriorating economic and political situation, including electoral challenges, public protests and strikes, and government breakdowns. Overall, this brief discussion shows that differences in national vulnerability profiles are associated with variation in adjustment strategies and crisis politics. Crisis management can be relatively uncontroversial in some countries, but can cause large political difficulties in those countries where the costs of both internal and external adjustment are high. What does the vulnerability analysis imply for the Euro crisis, and how is the euro crisis different? The fact that the Eurozone is a monetary union makes the politics of responding to the euro crisis unique in two key respects. First, the costs of external adjustment are exceptionally high for Eurozone members. Because external adjustment would imply Eurozone exit and possibly the loss of EU membership, such a step is likely to cause financial havoc and a huge economic and political fallout for both the exiting country and the European Union as a whole. Whereas this is less problematic for countries such as Ireland, for which internal adjustment is feasible, it places countries such as Greece, Portugal and Spain into the unfortunate vulnerability profile where any adjustment will be associated with high costs. Although these countries have traditionally addressed BOP problems through exchange-rate adjustment, these countries have tried to overcome the euro crisis through a combination of macroeconomic austerity, structural reforms and financing support. Yet, the political fallout of the crisis has been considerable. However, adjustment can also be achieved through policy reforms in countries with current account surpluses. In these cases, external adjustment conversely implies an appreciation of the exchange rate (and, in the euro zone, euro exit), whereas internal adjustment requires stimulating domestic demand and allowing higher inflation rates. In the euro crisis, many surplus countries are equally vulnerable to both of these adjustment strategies. For example, Germany is highly vulnerable to internal adjustment due to its high inflation aversion, but is equally vulnerable to a breakup of the Eurozone. The upshot of this analysis – that most countries are reluctant to reform – paints a rather depressing picture, because it suggests that EMU policymakers should have a difficult time in implementing a decisive crisis resolution strategy. The painful and drawn-out reform process, the convoluted and controversial politics of the euro crisis, and the strong reliance on external financing in the form of bailouts, the European Stability Mechanism (ESM) and growing Target2 balances all attest to these difficulties. Domestically, incumbents in deficit countries have been punished electorally, support for radical parties has increased and protest politics has become more prevalent in the wake of the crisis. A second unique feature of the euro crisis concerns the bargaining power of deficit and surplus countries. It is usually difficult for deficit countries to shift the burden of adjustment onto surplus countries, and the euro crisis has been no exception in this regard. EMU surplus countries such as Germany have proven to be rather reluctant to accept higher rates of inflation or to actively stimulate domestic demand, although the European Central Bank’s recent loose monetary policy can be interpreted as a small step in this direction. However, significant financial inter-linkages within the monetary union mean that the costs of a further escalation of the crisis or even a break-up of the Eurozone would be huge for deficit and surplus countries alike. This substantially increases the willingness of surplus countries to cooperate with deficit countries. Surplus countries that wish to avoid internal adjustment at home may therefore be more willing to contribute to a financing of current account deficits in peripheral countries through intra-EMU or intra-EU transfers, possibly even permanently. The discussions about a fiscal union, an EU-wide unemployment benefits scheme, or “intra-EU solidarity” more generally attest to this possibility and it is likely that these discussions will intensify if the crisis persists. Given that this is quite unpopular among many Europeans, however, such financing carries the risk of fueling already growing Eurosceptic sentiments within member states. Taken together then, this suggests that the resolution of the Eurozone’s problems will continue to be a drawn-out, painful and politically costly process. What does this discussion imply for Greek crisis politics? A comparison with the Eastern European experience shows that Greece’s balance-of-payments problems, and as such the size of the needed adjustment, were very large when the crisis erupted. Nevertheless, Greece exhibited by no means the biggest problems. Rather, a comparison of the average current account deficits for the period 2005 to 2007 shows that Greece’s current account deficit – and hence the size of the adjustment burden – was significantly smaller than the deficits in Latvia, Bulgaria, and Estonia. Nonetheless, these countries managed to address their crisis swiftly with huge cuts in public spending, tax increases and reductions in public sector employment. In contrast, crisis resolution has been highly contentious and protracted in the Greek case. Greek crisis politics has been characterized by much delay, a strong reliance on external funding, difficult relations with lenders and political conflict, public protests and the electoral success of extreme parties. This is typical for countries with a vulnerability profile in which both internal and external adjustment are very painful and politically costly. Greece clearly exhibits such a difficult vulnerability profile, because the structure of the domestic economy and political system complicate austerity and structural reforms, whereas euro exit is even more unattractive. Still, the events of the past months have raised the question whether the costs of internal adjustment will at some point surpass the costs of external adjustment. In other words, the question is whether Greece will at some point exit from EMU. Judging from the experience of other countries with a similar vulnerability profile, euro exit appears to be a distinct possibility. However, given that the Greek crisis is occurring in the context of a monetary union, the picture is rosier if three crucial aspects are considered. First, within Greece, popular and political support for the euro remains extraordinarily strong. In two public opinion surveys fielded in July and September 2015, more than two thirds of respondents supported staying in the Eurozone and the EU, and this support remained very high even when respondents were explicitly told that this would require more spending cuts and tax increases (Dinas et al. 2015). Even among those hit most harshly by the crisis, more than 60% supported Greece’s continued membership in the Eurozone. Second, there is also strong European support for keeping Greece in the Eurozone and especially in the EU. This is mostly driven by worries in other Eurozone countries that a “Grexit” would irrevocably damage the Eurozone and the European project more generally. As discussed above, the high vulnerability of other Eurozone countries to a Greek exit from the monetary union gives Greece considerable bargaining power. Even though the third bailout package has been associated with very tough conditions, the fact that a third program was granted is quite unusual in international comparison. Finally, and mostly as a consequence of the second point, Greece has been receiving more financial support than most countries facing BOP crises. Copelovitch and Enderlein (2014) show that in terms of loan size relative to the country’s economy, the 2010 and 2012 programs for Greece were among the largest the IMF has ever granted. At the same time, considering the size of the loans, Greece received comparatively few conditions. For example, conditionality in the 2010 Greek program was the second lowest among the euro crisis borrower countries. This contradicts the general notion that Greece has been subject to unusually harsh conditions, but attests to Greece’s ability to bargain with creditors. In sum, it is clear that were Greece not a member of EMU, external adjustment would probably have long been part of its adjustment strategy. But the membership in the monetary union changes the situation because the large cost of and uncertainty associated with euro exit have led to strong support, especially within Greece but also within Europe, for a continued Greek membership in the Eurozone. In the long run, the answer to the question whether Greece will exit from EMU will depend on whether the (perceived) opportunity costs of exit will change over time. Copelovitch, Mark, and Henrik Enderlein. 2014. "Kicking the Can Down the Road: The Euro Crisis and the Political Economy of Troika Bailouts." University of Wisconsin. Dinas, Elias, Ignacio Jurado, Nikitas Konstantinidis, and Stefanie Walter. 2015. "Survey evidence from the July 2015 Greek referendum and the September 2015 Greek elections.". Eichengreen, Barry. 1992. Golden Fetters: The Gold Standard and the Great Depression. New York: Oxford University Press. Simmons, Beth. 1994. Who Adjusts? Domestic Sources of Foreign Economic Policy During the Interwar Years. Princeton, NJ: Princeton University Press. Walter, Stefanie. 2013. Financial Crises and the Politics of Macroeconomic Adjustment. Cambridge: Cambridge University Press. ———. 2016. "Crisis politics in Europe: Why austerity is easier to implement in some countries than in others." Comparative Political Studies. Crisis management is easiest when the potential costs of both external and internal adjustment are low. Unfortunately, countries with severe balance of payments problems are unlikely to find themselves in this category.